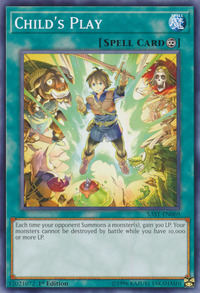 The characters in this card's artwork are similar to (and may therefore be based on,) the Japanese RPG series Dragon Quest, specifically the designs of the , and races within the games. This is the first card to specify a specific LP amount in the ten-thousands. By the same token, this in kind also makes this card the first to note a five-digit LP value, let alone any kind of LP number with more than four digits.